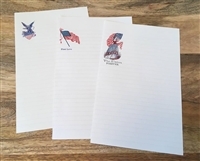 The Navy Stationery Set includes 3 different envelopes bearing 3 different designs. Just like with all of our other envelopes, these have a gummed flap that is the same shape as our originals, and is replicated in the same size. Each one comes with a small sheet of writing paper, and a postage stamp. Available postmarked, or left blank. If you'd like a specific city on all of them contact us, otherwise they will come with an assortment of northern cities. Custom postmarks can be made for a one time $5 fee, and will be available on all of your future envelope orders. Contact us for details. 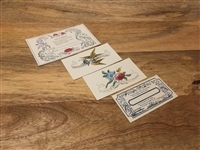 The Suave Zouave Stationary Set includes 3 different envelopes bearing 3 different designs. Just like with all of our other envelopes, these have a gummed flap that is the same shape as our originals, and is replicated in the same size. Each one comes with a small sheet of writing paper, and a postage stamp. Available postmarked, or left blank. If you'd like a specific city on all of them contact us, otherwise they will come with an assortment of northern cities. 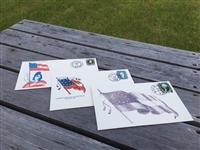 Custom postmarks can be made for a one time $5 fee, and will be available on all of your future envelope orders. Contact us for details. These small pocket journals measure approx 3" x 4.5" and have 50 lined pages, bound in a single signature with a hand sewn spine. Each book has a cover made from hand marbled paper, made by us in patterns common in the mid 19th century and earlier. The papers are marbled using period paint pigments, and are pasted onto the spine like many originals. As they are all made from hand marbled paper, no two will be exactly alike and the patterns will vary. If you have a request, we will do our best to honor it with what is in stock but make no guarantees. Available with a northern or southern binders label. Sentiment cards, about the same size or a little smaller than calling cards (A whole other topic) were a popular item in the mid-19th century. These early greeting cards were intended to be given to friends or associates as tokens. Many cards expressed feelings of love or friendship, while others bore religious or moral verses intended for the improvement of their recipients. Here we offer 20 beautifully colored reproduction sentiment cards. Each set contains 4 designs taken directly from originals, with 5 of each design included.. Our cards are perfect for exchanging with friends, or for soldiers to carry in their pockets as a sweetheart token.